Rich Kodilanen stands outside his 79 Renwick Street Water Purification Property in Newburgh, N.Y. 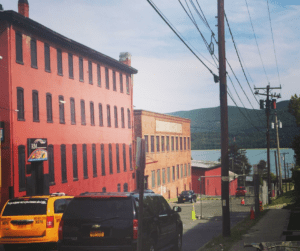 This turn-key water purification company is available in Newburgh, N.Y. Blocks from the waterfront & views to the river from the property. Of Finnish descent, owner Rich Kodilanen is a lean, burly fellow with an easy going way and the kind of blonde surfer looks more typical of a southern California seaside town. But don’t let his laid back appearance fool you. 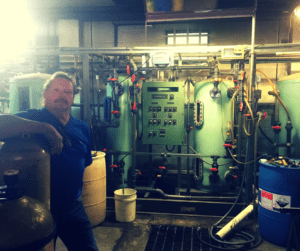 This rugged, tenacious and enterprising man has built a successful, small business in the water purification industry. Now, at sixty something years of age, Rich is ready to retire and pass on his business to a younger person up for running a small business that requires both physical ability and mental acuity. All this helped him when he started at a Culligan water dealership in New Windsor, but quickly learned of an opportunity in Puerto Rico servicing commercial clients. He moved to Puerto Rico and worked for several years servicing high quality de-ionized for the Pharmaceutical industry, and during this time the man he worked for became too relaxed about servicing his clients. 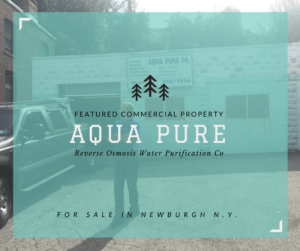 Taking on the clients meant starting his own business, and that is when he moved to Newburgh and began Aqua Pure in 1985. For thirty years, Rich has serviced numerous businesses and built a business with clients up and down the east coast. Rich explained that a great opportunity exists for those wishing to also service the home owner looking for clean water! His business is for sale for $300,000.00 and that includes equipment, building, two trucks and a forklift. Rich is eager to work with whomever may be interested, and he will stay on for a time to mentor. A great opportunity for a young entrepreneur with both a mechanical AND marketing bent.